When you write, your article headlines and subheadings are the first things people read. Many readers only scan the headlines without reading any of your body content. Your guide to converting is to make the articles engaging, and here’s how you can do that by altering your headline strategy. When crafting headlines for optimal conversion, the first factor to understand is how long each headline should be. This varies based on which platform the content will be viewed in. Here’s a 3-part guide to getting the right headline length. Different lengths are optimal for headlines shared on different platforms. When it comes to your articles, you need to first think: Google. When displaying your pages in Google’s search results, up to 70 characters will show up. Your headlines should be between 55 and 65 characters for optimal click-enticement. Studies show that word count for article headlines should be between 7-9 words. If you can say what you want to say in around 8 words, and keep it to around 60 characters, you’re doing great. #2: Should Social Media Headlines Be the Same Length? #3: How Long Should a Great Email Subject Line Be? According to Co-Schedule, the optimal length for an email subject line is 50 characters. With Hotmail’s recent system upgrade, this is debatable. As you can see above, the default view from inside Hotmail only shows about 37 characters of text in the headline. If you use the recommended 50 characters here, you may end up having important words cut off from viewers. So, in light of the discrepancies highlighted above, what can you do to ensure that email headlines generate the most clicks? Something called front-loading. You load the most important words for your subject into the beginning, and it's the first option. The next option is to segment your list. You can potentially segment your list into various groups, including basing lists on which email platform the reader uses. Then, you can create a different headline for one email newsletter for each platform: Yahoo, Outlook, Gmail, GoDaddy. The problem posed with this solution is that you may not be able to know what platform someone is in, if the email address is linked to a website besides one listed above. The length of your headline is only a small part of perfecting the craft. The words you use -- and how you use them -- will play the most important role in the conversion process. These are the 3 types of headlines that have the highest conversions. List Post Headlines (Listicles) - These get the most social shares. How-To Headlines - These are the most sought after, linked-to, and bookmarked content. Question Headlines - Tip: Tease the answer to a headline question in your intro. 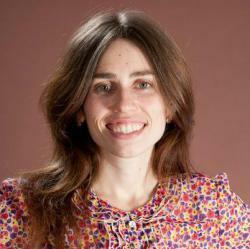 Generic headline types will work -- sometimes -- if you use the right words. In 2014, Kevan Lee, a content crafter at Buffer, analyzed the web’s most viral content headlines, and found a ton of information that provides some never-before-seen value. Many of these words are generic, and it comes as no surprise, but let’s take a deeper look at 2 of them. First, the word “this” implies a sense of urgency. The word “you” creates personalization. Try integrating these words into your titles and see how they work. You can do this! This list is a must-have when you’re crafting your next headlines. You may want to bookmark this page now. Tip: Try playing with different variations of the same headline to see which gets the most clicks and shares over a range of time, so you can start getting an idea of what your readers like best. Although you don’t necessarily want keywords to be your main focus -- engagement should be your primary goal -- they should be integrated into your headlines. Here’s how. If you’re implementing SEO, you probably have a list of keyword terms that you found in Google Adwords Keyword Planner. am I right? Well, you should know that this practice is only the foundation of what you really need. Let’s dig a little deeper. Pretend that you’re a real estate agent that lives in Tampa, FL. You’re trying to appeal to clients who may be interested in purchasing one of your listings and you have decided to implement a blog as an inbound strategy for your online marketing. 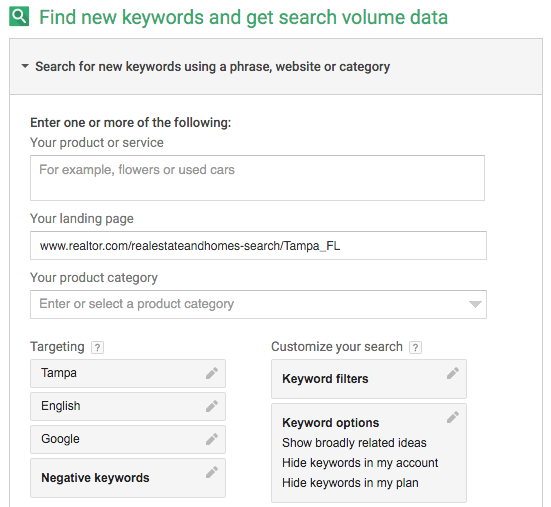 If you use Google’s Keyword Planner, you first want to do this: Search Google for “Homes for sale Tampa, FL” -- trust me, this is right. The first keyword idea is “florida real estate,” and it has low competition. But for this exercise, competition doesn’t matter, and we are going to choose the most relevant idea with the highest number of searches instead: “homes for sale in fl,” which has 1300 monthly searches. If you really were an agent, would you ever have any home listings for sale in Miami or the surrounding areas? Orlando? If the search term is relevant, you would want to make a note of it. Now, we’ve got a decent list from which to generate topic ideas, and we can explore how to create a brilliant headline and subheadings with one of them. Because it has the most substance, let’s go with the first on the list. You could create a blog post titled “Homes for Sale in Tampa Florida With Pools,” but if you do, you haven’t learned anything from this article. It’s not hard to see why so many people are buying homes in Tampa and so few are for sale. The locals are enjoying the sunshine, and sipping on cocktails while the rest of the nation is stuck in traffic. Here’s how to live like you were born here when you visit this central coast city. Notice that the keywords are used in the title, the subtitle, and in the first sentence of the introduction, but not worded like an advertisement, or in the exact search terms. 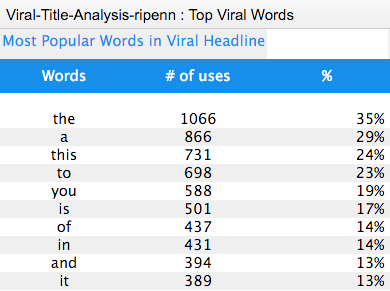 We’ve integrated words and phrases from the most viral headlines on the web and used the correct headline length for a blog post for inbound search. That’s how you want to approach all of your headlines from now on. Go ahead; try it now and tell us what you come up with in the comments.